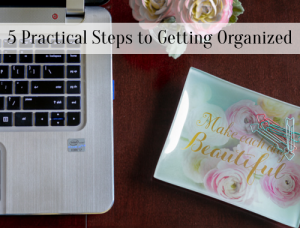 You may remember when I updated and organized our master closets last year. 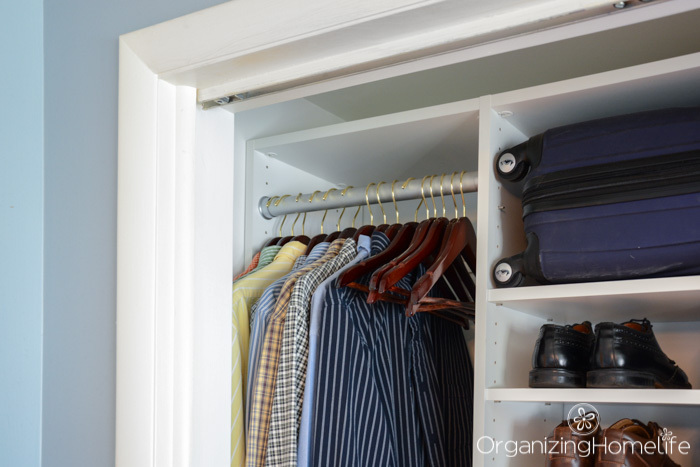 I’m happy to say, they’re still amazing and make such great use of the space in our small reach-in closets. Yikes! What is going on there?!? 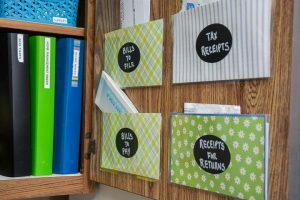 You see, my hubby is not a slob by any means, but let’s just say that organization isn’t his highest priority. He has his own “systems”, but I haven’t quite figured out what they are yet. You can see in the picture above that there are shirts and pants all mixed up and even hangers facing the wrong way. Why? Some of it is part of his “system”, part is because, well, he just doesn’t remember where things go. Check this out. Instead of washing a shirt that may have only been worn for a few hours, he turns the hanger around backwards so he can remember that it’s been worn before. I have to admit, it’s “sort of” a good idea, but the organizer in me cringes whenever I look at his mis-matched, multi-directional system. Enter the Xangar (affiliate link). The what, you ask? 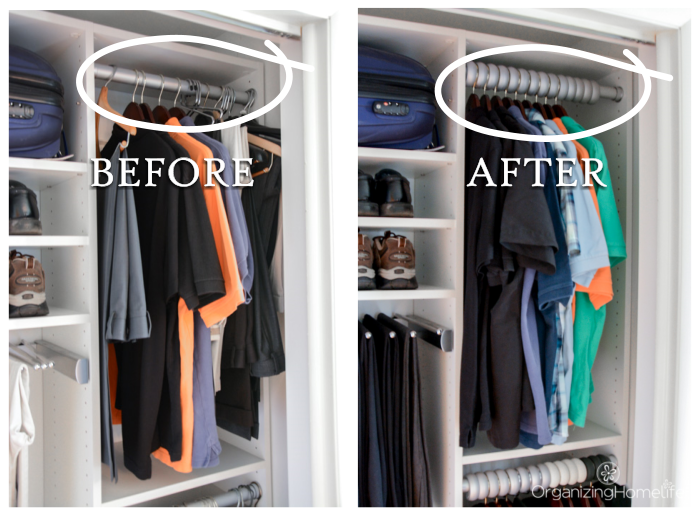 It’s called a Xangar – a hanger spacer created to evenly space your hangers. I have to be honest with you: when I was first asked to review these, I almost turned down the offer. Although I am a little OCD with my closets, as a busy mom of four kids, I’m not really that concerned if my hangers are perfectly spaced. First, let me tell you a little bit about them. 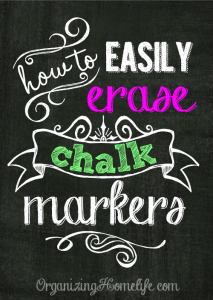 They’re made of heavy-duty, flexible foam and glide easily on the rod. It literally takes seconds to “install”. Just pop them right on the rod. BUT…then an idea hit me. 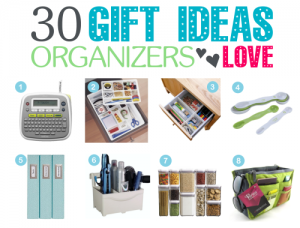 These things have a lot more versatility than just spacing hangers. They are actually an answer to the problem I have been trying to solve in my hubby’s closet for years. Remember how I told you he sometimes wears shirts more than once if he hasn’t worn it very long? Well, now he doesn’t have to turn his hangers backwards (and drive me crazy). I added both gray and silver Xangars to the rod with his business casual shirts. 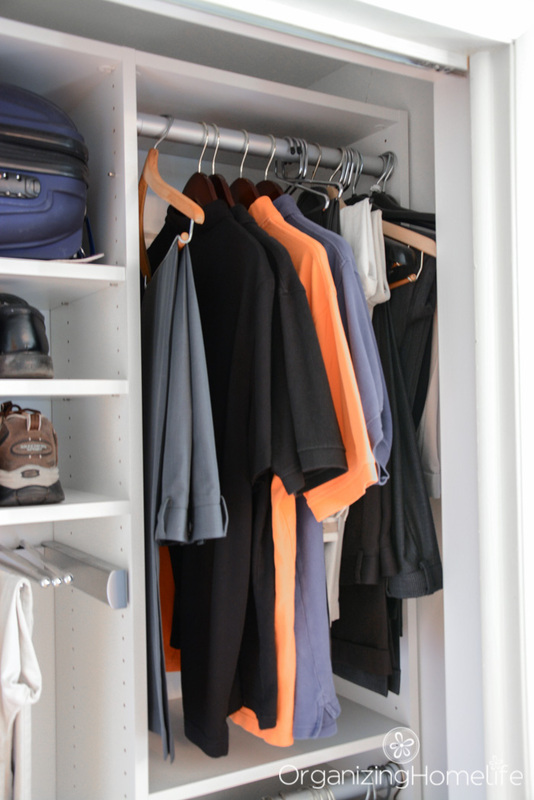 When his clean shirts get put in the closet, they get hung in the silver area. If he decides one can be worn a second time, he’ll hang it in the dark gray area. He knows that if he takes a shirt from that area, it goes into the laundry at the end of the day. And, I have to admit, I’m loving the spacing. It just looks so neat, but I love that it’s useful, too. I never ironed his shirts because they always got wrinkled from being smushed in the closet. Not anymore. The Xangars are about 1″ thick – just about the perfect amount of space to separate clothes so they don’t get crushed, yet also don’t take up too much precious hanging space. And let’s talk about those suits. Yikes. 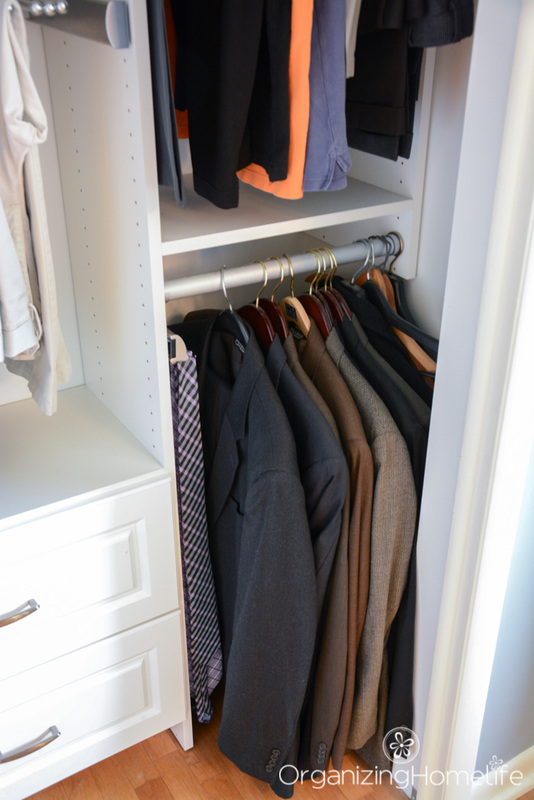 Since there is no order to where on the rack he hangs his suits, I can’t keep track of when they’ve been cleaned. Plus, part of the mis-matched problem on the rod above the suits is he’s got suit pants hanging there. 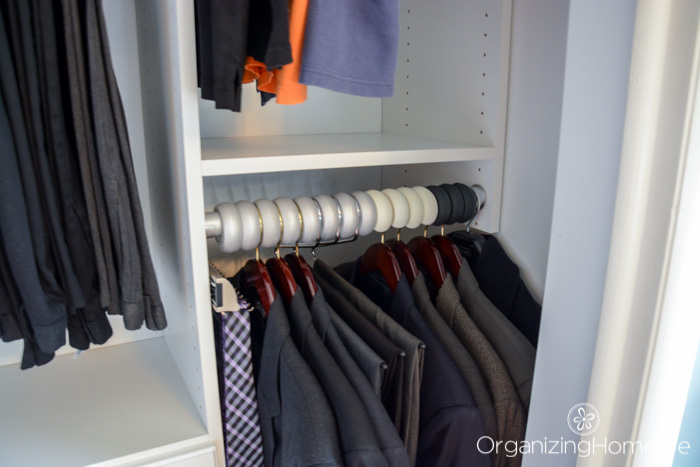 They were getting mixed up with his business casual pants on the slide out pant organizer, so he started hanging them with his shirts. Xangar for the win again. This time I used three different colors so we can keep track of the rotation. I used silver for the clean suits and suit pants, white for when they’ve been worn once or twice, and dark gray when they’re almost ready to go to the cleaners. It’s actually not good to dry clean suits too often, so I think this system is perfect for keeping track so we don’t send them too often, or not often enough. I LOVE how versatile these are! They’re so simple to change out when the clothing changes, too, so I decided to keep a few extra in his top drawer. 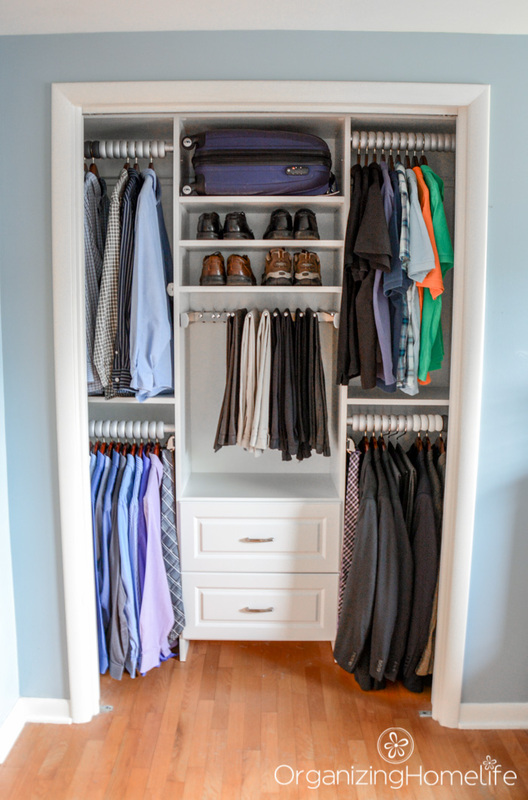 If you love a neat and organized closet, I know I need not say more. You’re swooning, aren’t you? 😉 I’m looking forward to putting Xangars in all my closets. I have great news for you! 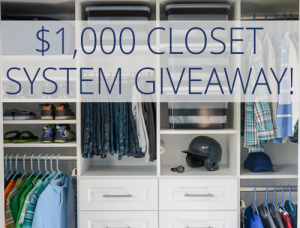 I’m happy to tell you that you can win a 50 pack of Xangars to organize your closet!! You can also find them on Amazon here. Thanks to Xangar for sending me this product and sponsoring this post. This post contains affiliate links which means I may earn a small percentage if you purchase a product through this link. You will never be charged a cent more, it’s just a way companies reward websites for sharing products they love with their readers. 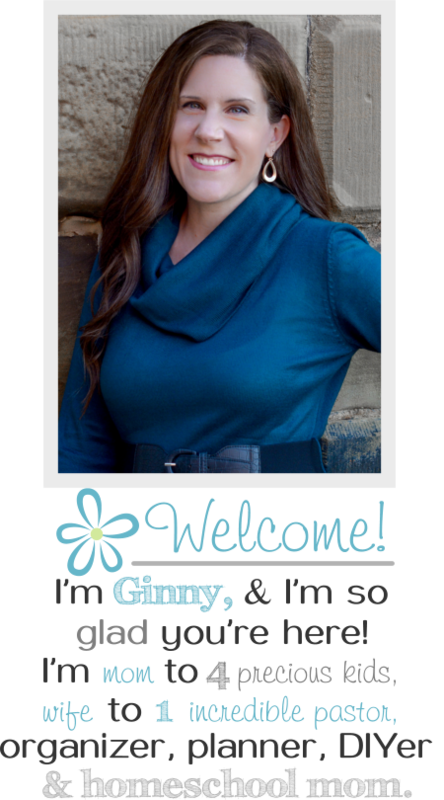 See my full disclosure policy here. 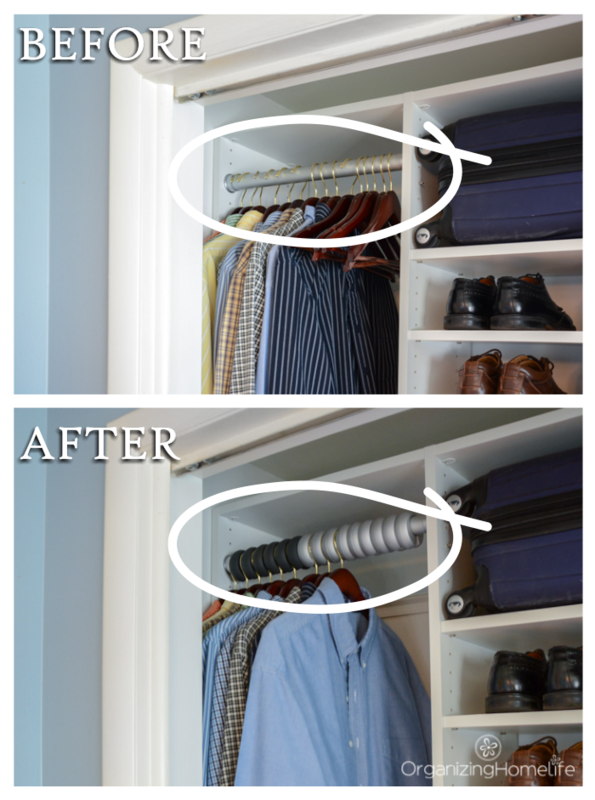 I really think this would help our closets tremendously. Thanks for the opportunity to win! 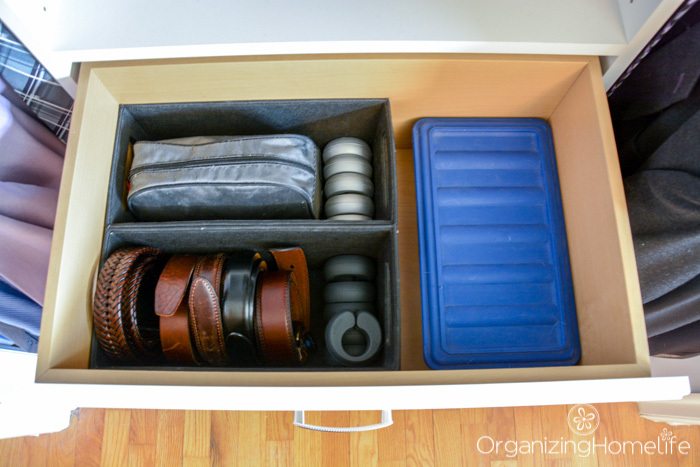 Would love these to help keep my husband’s suits organized. I also need them for me! You know the did I wear it or not? Does it need to be dry cleaned?So, I could try a set, too. Love the evenly spaced look and the wrinkle saving factor! 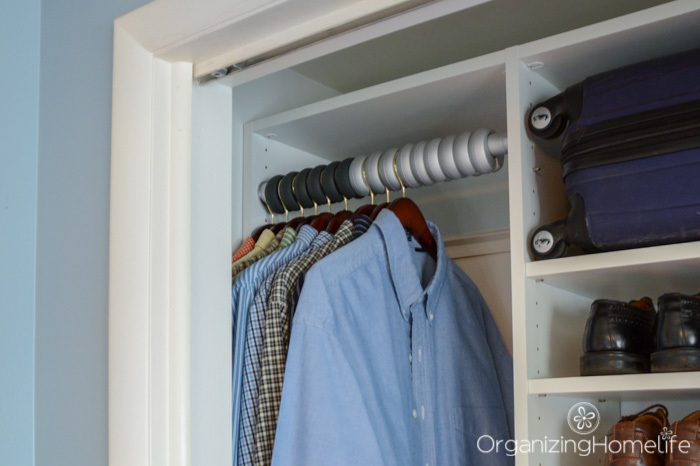 I love the way these make the closet look, but I really like that they’ll help prevent my kids from cramming their clothes together in the closet. Less cramming means less ironing for momma! I would love to try these. I am one who turns their hangers around to help me see what clothes I have worn and the ones I have not. This would help with that. 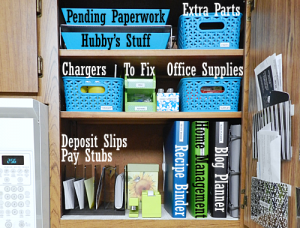 I LOVE organizing my home! Makes for restful atmosphere! These look fabulous! I’d love to add them to my closets. I love that these Xangers make your closet look like one in a retail shop! I like the color coding idea. These are great! I can’t wait to try them! 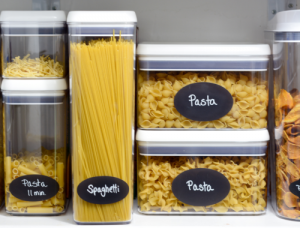 Love that they come in different colors for even more organizing…and no more hanger jams! I love that you can organize when a shirt has been worn only a few hours. Awesome. I love the way they make it look so pretty and neat. I can’t believe you’re complaining about hangers going two different directions. I can’t even get my husband to USE a hanger. He keeps his clean clothes in a pile on the spare basement couch and the dirty ones are left all over the house. I’ve tried. I really have. But that’s his “system.” Sigh. I can’t even begin to tell you how amazingly good looking your husband’s before closet pictures are. Lol! 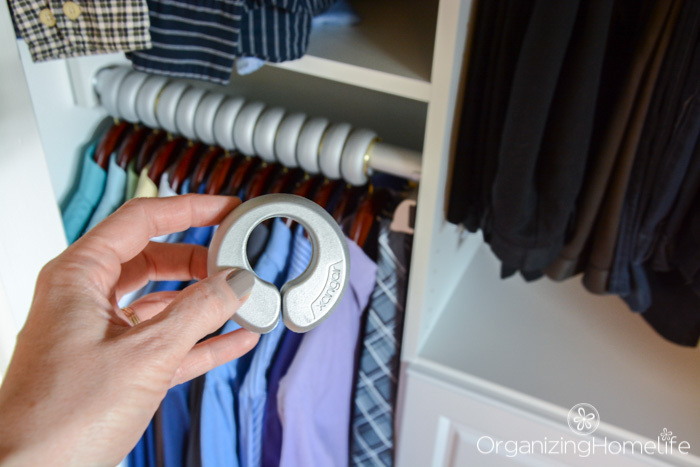 Xangars are beautiful, easy to use, make closets look wonderfully organized, prevent wrinkling in clothes, keep hangers from bunching together and overlapping, and simplify getting clothes into and out of closets. In short, there is much to love about Xangars. That they keep it evenly spaced! 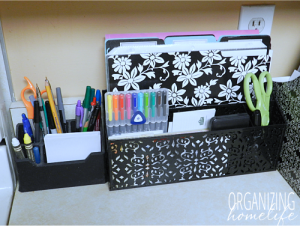 I love how they help you be organized and the different color options. 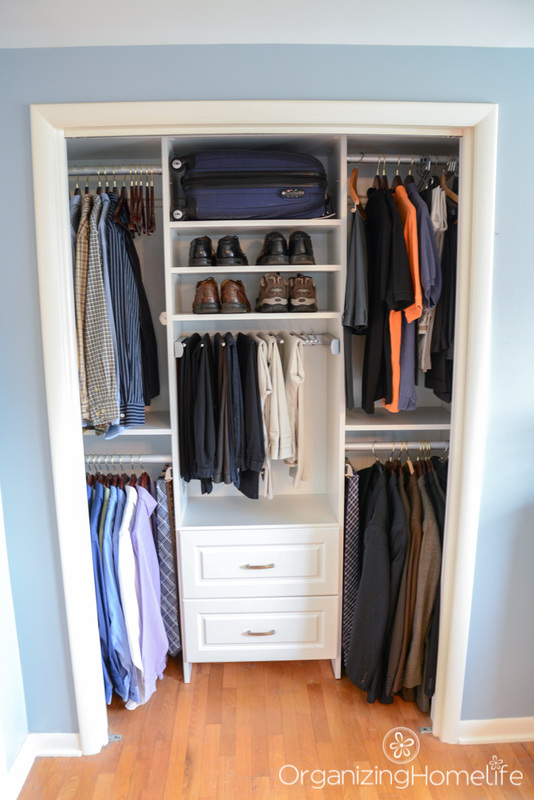 Makes it look neat and easily able to find what your looking for and to sort your clothing. This is right up my alley! Thanks for the tips and ideas.